The general classification was won for the first time by 2017 Tour de France champion Chris Froome from Team Sky, ahead of Vincenzo Nibali of Bahrain–Merida. Froome became the third rider to win the Tour-Vuelta double after Jacques Anquetil (1963) and Bernard Hinault (1978), and the first to do so since the Vuelta was moved to its current calendar position. 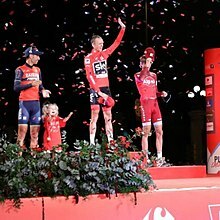 Froome also won the points and combination classifications, becoming the first rider to win three jerseys in a single Vuelta since Denis Menchov in 2008. The mountains classification was won by Cannondale–Drapac rider Davide Villella, while Trek–Segafredo's Alberto Contador won the combativity award in his final Grand Tour, as well as the final mountain stage atop the iconic Angliru. Astana took the team award. For a more comprehensive list, see List of teams and cyclists in the 2017 Vuelta a España. The Arena of Nîmes in Nîmes, France, hosted the team presentation ceremony on 19 August. The 2017 edition of the Vuelta a España consisted of 22 teams. All eighteen UCI WorldTeams were entitled, and obliged, to enter the race. On 27 March 2017, the organiser of the Vuelta, Unipublic, announced the four second-tier UCI Professional Continental teams given wildcard invitations. The presentation of the teams – where the members of each team's roster are introduced in front of the media and local dignitaries – took place inside the Arena of Nîmes in Nîmes, France, on 19 August, before the start of stage one, held in the city. Each squad was allowed a maximum of nine riders, resulting in a start list total of 198 riders. Of these, 75 were competing in their first Vuelta a España. The total number of riders that finished the race was 158. The riders came from 33 countries. Six countries had more than 10 riders in the race: Spain (31), France (20), Italy (20), Belgium (17), the Netherlands (15), and Colombia (12). The average age of riders in the race was 27.6 years, ranging from the 20-year-old Lennard Kämna (Team Sunweb) to the 40-year-old Svein Tuft (Orica–Scott). Team Manzana Postobón had the youngest average age while Trek–Segafredo had the oldest. The 2017 Tour de France winner Chris Froome (Team Sky) was seen by many as the leading pre-race favourite. Reigning Vuelta champion Nairo Quintana (Movistar Team) chose not to defend his title, after having competed in both the Giro d'Italia and the Tour de France earlier in the season. Chris Froome (Team Sky), who arrived at the Vuelta having won his fourth Tour de France the month before, was considered the favourite by most commentators and bookmakers. Froome had previously finished second at the Vuelta on three occasions. A victory in Spain would make him only the third rider after Jacques Anquetil (in 1963) and Bernard Hinault (in 1978) to win both the Tour and the Vuelta in the same season, and the first rider to do so since the race was moved in the calendar from spring to late summer. It would also make him the first British rider to win the race. In Quintana's absence, bib number one was handed to three-time winner Alberto Contador (Trek–Segafredo), who announced in early August that he would retire from cycling after the race. Contador was considered to be among the favourites, although his performances in recent Grand Tours had cast doubt upon his potential. 2010 winner Vincenzo Nibali (Bahrain–Merida) was considered to be Froome's closest rival for overall victory, having skipped the Tour de France. Fabio Aru (Astana), winner of the 2015 edition, started the race as a favourite as well after he performed well to finish fifth overall at the Tour de France. The previous year's third-placed finisher, Esteban Chaves (Orica–Scott), was also given chances to win the race overall. Other riders mentioned to potentially finish high in the general classification were Steven Kruijswijk (LottoNL–Jumbo) and Rafał Majka (Bora–Hansgrohe), third in 2015. Potential favourites to make their debut at the Vuelta were Ilnur Zakarin (Team Katusha–Alpecin), who had finished fifth at the Giro d'Italia in May, as well as both Adam and Simon Yates (both Orica–Scott). The route of the 2017 Vuelta a Espana was revealed by Unipublic on 12 January 2017. Keeping with the tradition of the past few years, the race started off with a team time trial. However, the race started in France, just the third time in history that the Spanish Grand Tour began outside of its home country. The third stage saw the race leave France, with a mountain stage to Andorra la Vella. The first uphill finale was on stage 5, with a summit finish atop the Ermita de Santa Lucía. The queen stage of the 2017 Vuelta was stage 20, which featured a summit finish atop the Alto de l'Angliru. Finally, the race ended with a customary circuit race in Madrid. The Vuelta a España had three individual classifications, for which jerseys were awarded daily to the leading rider, as well as a team competition. The primary classification was the general classification, which was calculated by adding each rider's finishing times on each stage. Time bonuses were awarded at the end of every stage apart from the two individual time trials. The rider with the lowest cumulative time was the leader of the general classification, and wears the red jersey. The leader of the general classification at the end of the race was considered the overall winner of the Vuelta a España. The next classification was the mountains classification. Points were awarded to the riders that reached the summit of the most difficult climbs first. The climbs were categorized, in order of increasing difficulty, third-, second-, and first- and special-category. The leader wore a white jersey with blue polka dots. The final of the individual classifications was the combination classification. A rider's ranking in the combination classification was determined by tallying up his positions in the general, points, and mountains classifications. The leader wore a white jersey. If no rider was classified in all three classifications, riders classified in two would have been considered, and if that was tied the general classification will decide the winner. There was also the team classification. After each stage, the times of the three highest finishers of each team are added together. The victory was awarded to the team with the lowest cumulative time at the end of the event. In addition, there were two individual awards: the combativity award and the young rider award. The combativity award was given after each stage to the rider "who displayed the most generous effort and best sporting spirit." The daily winner wore a green number bib the following stage. At the end of the Vuelta, a jury decides the top three riders for the "Most Combative Rider of La Vuelta", with a public vote deciding the victor. The young rider award is calculated the same way as the general classification, but the classification was restricted to riders who were born on or after 1 January 1992. The leader wore a red number bib. A total of €1,120,230 will be awarded in cash prizes in the race. The overall winner of the general classification will receive €150,000, with the second and third placed riders getting €57,000 and €30,000 respectively. All finishers in the top 20 were awarded with money. The holders of the four individual classifications benefited on each stage they led. The final winners of the points and combined were given €11,000, while the mountains classification got €23,100 and the most combative rider got €3,000. The team classification winners were given €12,500. €11,000 was given to the winners of each stage of the race, with smaller amounts given to places 2–20. There was also a special award with a prize of €1,000, the Cima Alberto Fernández, given to first rider (Miguel Ángel López) to reach the summit of the Alto Hoya de la Mora at the finish of stage fifteen. Final podium of the 2017 Vuelta a España. Team Sky 82h 30' 02"
Vincenzo Nibali (ITA) Bahrain–Merida + 2' 15"
Ilnur Zakarin (RUS) Team Katusha–Alpecin + 2' 51"
Wilco Kelderman (NED) Team Sunweb + 3' 15"
Wout Poels (NED) Team Sky + 6' 59"
Michael Woods (CAN) Cannondale–Drapac + 8' 27"
Steven Kruijswijk (NED) LottoNL–Jumbo + 11' 18"
Tejay van Garderen (USA) BMC Racing Team + 15' 50"
Esteban Chaves (COL) Orica–Scott + 16' 46"
Louis Meintjes (RSA) UAE Team Emirates + 17' 41"
Fabio Aru (ITA) Astana + 21' 41"
Nicolas Roche (IRL) BMC Racing Team + 22' 00"
Sergio Pardilla (ESP) Caja Rural–Seguros RGA + 22' 59"
Mikel Nieve (ESP) Team Sky + 28' 00"
Romain Bardet (FRA) AG2R La Mondiale + 31' 21"
Daniel Moreno (ESP) Movistar Team + 42' 16"
Sander Armée (BEL) Lotto–Soudal + 59' 01"
Darwin Atapuma (COL) UAE Team Emirates + 1h 02' 58"
Jack Haig (AUS) Orica–Scott + 1h 04' 48"
José Joaquín Rojas (ESP) Movistar Team + 1h 05' 02"
Pello Bilbao (ESP) Astana + 1h 06' 22"
Luis Ángel Maté (ESP) Cofidis + 1h 13' 27"
Franco Pellizotti (ITA) Bahrain–Merida + 1h 13' 36"
Jaime Rosón (ESP) Caja Rural–Seguros RGA + 1h 17' 12"
Gianni Moscon (ITA) Team Sky + 1h 21' 17"
Antwan Tolhoek (NED) LottoNL–Jumbo + 1h 21' 46"
Stef Clement (NED) LottoNL–Jumbo + 1h 26' 13"
Matej Mohorič (SLO) UAE Team Emirates + 1h 31' 24"
Peter Stetina (USA) Trek–Segafredo + 1h 36' 35"
Luis León Sánchez (ESP) Astana + 1h 36' 50"
Jarlinson Pantano (COL) Trek–Segafredo + 1h 39' 27"
Adam Yates (GBR) Orica–Scott + 1h 39' 51"
Igor Antón (ESP) Team Dimension Data + 1h 42' 33"
Richard Carapaz (ECU) Movistar Team + 1h 43' 59"
Hernán Aguirre (COL) Team Manzana Postobón + 1h 49' 26"
Jan Polanc (SLO) UAE Team Emirates + 1h 52' 14"
Rafał Majka (POL) Bora–Hansgrohe + 1h 53' 59"
Bart De Clercq (BEL) Lotto–Soudal + 1h 54' 19"
Koen Bouwman (NED) LottoNL–Jumbo + 1h 55' 00"
Bob Jungels (LUX) Quick-Step Floors + 1h 58' 17"
Rui Costa (POR) UAE Team Emirates + 1h 58' 46"
Simon Yates (GBR) Orica–Scott + 2h 02' 43"
Aldemar Reyes (COL) Team Manzana Postobón + 2h 03' 25"
Giovanni Visconti (ITA) Bahrain–Merida + 2h 11' 10"
Nelson Oliveira (POR) Movistar Team + 2h 16' 03"
Marc Soler (ESP) Movistar Team + 2h 19' 27"
Bernardo Suaza (COL) Team Manzana Postobón + 2h 23' 21"
Ricardo Vilela (POR) Team Manzana Postobón + 2h 25' 21"
Antonio Pedrero (ESP) Movistar Team + 2h 27' 03"
Anthony Roux (FRA) FDJ + 2h 28' 01"
Diego Rosa (ITA) Team Sky + 2h 31' 16"
Stéphane Rossetto (FRA) Cofidis + 2h 33' 53"
Tomasz Marczyński (POL) Lotto–Soudal + 2h 34' 33"
Fabricio Ferrari (URU) Caja Rural–Seguros RGA + 2h 39' 52"
Thomas De Gendt (BEL) Lotto–Soudal + 2h 39' 53"
Stefan Denifl (AUT) Aqua Blue Sport + 2h 41' 15"
Tobias Ludvigsson (SWE) FDJ + 2h 42' 20"
Daan Olivier (NED) LottoNL–Jumbo + 2h 42' 35"
Clément Chevrier (FRA) AG2R La Mondiale + 2h 42' 41"
Floris De Tier (BEL) LottoNL–Jumbo + 2h 44' 41"
Jérémy Maison (FRA) FDJ + 2h 45' 01"
Jesús Hernández (ESP) Trek–Segafredo + 2h 45' 39"
Emanuel Buchmann (GER) Bora–Hansgrohe + 2h 57' 29"
David López (ESP) Team Sky + 2h 58' 17"
Paweł Poljański (POL) Bora–Hansgrohe + 2h 58' 35"
Julian Alaphilippe (FRA) Quick-Step Floors + 2h 59' 11"
Jetse Bol (NED) Team Manzana Postobón + 2h 59' 17"
Alessandro De Marchi (ITA) BMC Racing Team + 3h 00' 15"
Enric Mas (ESP) Quick-Step Floors + 3h 02' 34"
Alberto Losada (ESP) Team Katusha–Alpecin + 3h 06' 59"
Carlos Verona (ESP) Orica–Scott + 3h 07' 12"
Simon Clarke (AUS) Cannondale–Drapac + 3h 07' 58"
Alexey Lutsenko (KAZ) Astana + 3h 08' 08"
Héctor Sáez (ESP) Caja Rural–Seguros RGA + 3h 09' 06"
Koen de Kort (NED) Trek–Segafredo + 3h 09' 17"
Salvatore Puccio (ITA) Team Sky + 3h 09' 44"
Valerio Agnoli (ITA) Bahrain–Merida + 3h 09' 53"
Anthony Perez (FRA) Cofidis + 3h 13' 46"
Daniel Navarro (ESP) Cofidis + 3h 17' 49"
Jacques Janse van Rensburg (RSA) Team Dimension Data + 3h 18' 23"
Lluís Mas (ESP) Caja Rural–Seguros RGA + 3h 18' 29"
Matteo Trentin (ITA) Quick-Step Floors + 3h 18' 41"
Julien Bernard (FRA) Trek–Segafredo + 3h 22' 16"
Przemysław Niemiec (POL) UAE Team Emirates + 3h 25' 48"
Juan Felipe Osorio (COL) Team Manzana Postobón + 3h 27' 41"
Guillaume Bonnafond (FRA) Cofidis + 3h 28' 17"
David Arroyo (ESP) Caja Rural–Seguros RGA + 3h 32' 34"
Lachlan Morton (AUS) Team Dimension Data + 3h 32' 57"
Edward Theuns (BEL) Trek–Segafredo + 3h 33' 03"
Francisco Ventoso (ESP) BMC Racing Team + 3h 33' 37"
Fernando Orjuela (COL) Team Manzana Postobón + 3h 33' 54"
Sergey Chernetskiy (RUS) Astana + 3h 35' 00"
Adam Hansen (AUS) Lotto–Soudal + 3h 37' 11"
Patrick Konrad (AUT) Bora–Hansgrohe + 3h 37' 18"
Cannondale–Drapac + 3h 37' 57"
Chad Haga (USA) Team Sunweb + 3h 44' 08"
Alexis Gougeard (FRA) AG2R La Mondiale + 3h 46' 38"
Iván García (ESP) Bahrain–Merida + 3h 47' 27"
Joe Dombrowski (USA) Cannondale–Drapac + 3h 47' 58"
Antonio Nibali (ITA) Bahrain–Merida + 3h 50' 02"
Arnaud Courteille (FRA) FDJ + 3h 50' 13"
Eros Capecchi (ITA) Quick-Step Floors + 3h 52' 20"
Domen Novak (SLO) Bahrain–Merida + 3h 52' 56"
Søren Kragh Andersen (DEN) Team Sunweb + 3h 52' 58"
Christopher Juul-Jensen (DEN) Orica–Scott + 3h 53' 31"
Julien Duval (FRA) AG2R La Mondiale + 3h 54' 03"
Damiano Caruso (ITA) BMC Racing Team + 3h 54' 23"
Bert-Jan Lindeman (NED) LottoNL–Jumbo + 3h 55' 09"
Nick Schultz (AUS) Caja Rural–Seguros RGA + 3h 55' 40"
Loïc Vliegen (BEL) BMC Racing Team + 3h 56' 01"
Brendan Canty (AUS) Cannondale–Drapac + 3h 57' 55"
Juan José Lobato (ESP) LottoNL–Jumbo + 4h 02' 01"
Hugo Houle (CAN) AG2R La Mondiale + 4h 03' 18"
Manuele Boaro (ITA) Bahrain–Merida + 4h 03' 24"
Anthony Turgis (FRA) Cofidis + 4h 06' 21"
Marco Haller (AUT) Team Katusha–Alpecin + 4h 06' 31"
Markel Irizar (ESP) Trek–Segafredo + 4h 07' 16"
Johannes Fröhlinger (GER) Team Sunweb + 4h 08' 43"
Chris Hamilton (AUS) Team Sunweb + 4h 12' 42"
Laurens De Vreese (BEL) Astana + 4h 12' 46"
Toms Skujiņš (LAT) Cannondale–Drapac + 4h 13' 16"
Christian Knees (GER) Team Sky + 4h 13' 46"
Daniel Hoelgaard (NOR) FDJ + 4h 17' 04"
Magnus Cort (DEN) Orica–Scott + 4h 17' 37"
Diego Rubio (ESP) Caja Rural–Seguros RGA + 4h 19' 46"
Michel Kreder (NED) Aqua Blue Sport + 4h 21' 18"
Tim Declercq (BEL) Quick-Step Floors + 4h 21' 20"
Niki Terpstra (NED) Quick-Step Floors + 4h 23' 54"
Sacha Modolo (ITA) UAE Team Emirates + 4h 27' 08"
Rafael Reis (POR) Caja Rural–Seguros RGA + 4h 27' 14"
Tom Van Asbroeck (BEL) Cannondale–Drapac + 4h 29' 59"
Maxim Belkov (BEL) Team Katusha–Alpecin + 4h 30' 01"
Hernando Bohórquez (COL) Team Manzana Postobón + 4h 31' 44"
Yves Lampaert (BEL) Quick-Step Floors + 4h 32' 02"
Michael Mørkøv (DEN) Team Katusha–Alpecin + 4h 33' 01"
Mark Christian (GBR) Aqua Blue Sport + 4h 36' 26"
Lasse Norman Hansen (DEN) Aqua Blue Sport + 4h 38' 56"
Aaron Gate (NZL) Aqua Blue Sport + 4h 40' 07"
Peter Koning (NED) Aqua Blue Sport + 4h 41' 00"
Christoph Pfingsten (GER) Bora–Hansgrohe + 4h 41' 29"
Sam Bewley (NZL) Orica–Scott + 4h 43' 27"
Andreas Schillinger (GER) Bora–Hansgrohe + 4h 44' 03"
Nikita Stalnov (ITA) Astana + 4h 44' 07"
Kenneth Vanbilsen (BEL) Cofidis + 4h 44' 33"
Rein Taaramäe (EST) Team Katusha–Alpecin + 4h 46' 21"
Ian Stannard (GBR) Team Sky + 4h 47' 00"
Federico Zurlo (ITA) UAE Team Emirates + 4h 47' 04"
Rémy Mertz (BEL) Lotto–Soudal + 4h 49' 50"
Ian Stannard (BEL) Lotto–Soudal + 4h 53' 38"
Juan Sebastián Molano (COL) Team Manzana Postobón + 4h 54' 27"
Thomas Scully (NZL) Cannondale–Drapac + 4h 56' 59"
Michael Schwarzmann (GER) Bora–Hansgrohe + 4h 57' 10"
Adam Blythe (GBR) Aqua Blue Sport + 4h 58' 28"
Lorrenzo Manzin (FRA) FDJ + 5h 01' 29"
William Clarke (AUS) Cannondale–Drapac + 5h 03' 10"
Conor Dunne (IRL) Aqua Blue Sport + 5h 16' 23"
1 Astana 247h 16' 21"
2 Movistar Team + 6' 16"
3 Team Sky + 8' 12"
4 UAE Team Emirates + 49' 02"
5 LottoNL–Jumbo + 1h 07' 28"
6 Orica–Scott + 1h 35' 21"
7 Bahrain–Merida + 2h 02' 09"
8 Caja Rural–Seguros RGA + 2h 07' 45"
9 BMC Racing Team + 2h 10' 38"
10 Quick-Step Floors + 2h 28' 01"
The race was the 25th of the 38 events in the UCI World Tour, with riders from the WorldTeams competing for individually and for their teams for points that contributed towards the rankings. Riders from both the WorldTeams and Professional Continental teams also competed individually and for their nations for points that contributed towards the UCI World Ranking, which included all UCI races. The points accrued by Chris Froome moved him up to second from tenth in the World Tour and rose to third from sixth in the World Ranking. Greg Van Avermaet (BMC Racing Team) held the lead of both individual rankings. Team Sky took the lead of the World Tour team ranking and Belgium remained top of the World Ranking nation ranking. On 13 December 2017, it was announced by Team Sky that Chris Froome was found with 2000 ng/ml of Salbutamol in a sample collected on 7 September, after the finish of stage 18. Froome, who suffers from asthma, is allowed a dose of 1000 ng/ml. If the UCI had found this to be a doping violation, he could have lost his Vuelta title and faced a potential ban from competitive cycling. On July 2, 2018, the UCI, with the cooperation of WADA, ruled that upon review of the submitted evidence that there was no wrongdoing and closed the case, exonerating Froome and allowing his 2017 Vuelta win to stand. ^ Although Rohan Dennis received the jersey on the podium in Nimes, no points were on offer during the stage. Alessandro De Marchi wore the jersey in stage two. ^ In stage three, Matteo Trentin, who was second in the points classification, wore the green jersey, because first-placed Yves Lampaert wore the red jersey as leader of the general classification. ^ In stages four to eight and ten to fourteen, Esteban Chaves, who was second in the combination classification, wore the white jersey, because first-placed Chris Froome wore the red jersey as leader of the general classification. In stage nine, Jan Polanc wore the white jersey for the same reason, as did Vincenzo Nibali in stage fifteen, Miguel Ángel López in stages sixteen to twenty and Alberto Contador in stage twenty-one. ^ a b In stages ten, sixteen, seventeen, nineteen and twenty, Matteo Trentin, who was second in the points classification, wore the green jersey, because first-placed Chris Froome wore the red jersey as leader of the general classification. In stages eighteen and twenty-one, Vincenzo Nibali wore the green jersey for the same reason. ^ a b c "Vuelta a España set for French start in 2017". Cycling Weekly. 2 September 2016. Retrieved 2 September 2016. ^ "2017 Vuelta a Espana to start in Nimes". Cycling News. 2 September 2016. Retrieved 2 September 2016. ^ "Chris Froome wins Vuelta a Espana win: Stage-by-stage guide to the victory". BBC Sport. 10 September 2017. Retrieved 19 September 2017. ^ "Chris Froome seals Vuelta a España title to win historic Vuelta-Tour double". Guardian. 10 September 2017. Retrieved 19 September 2017. ^ "Chris Froome completes Tour de France - Vuelta a Espana double". Cyclingnews.com. Immediate Media Company. 10 September 2017. Archived from the original on 17 September 2015. Retrieved 11 September 2017. ^ "Teams – The riders, videos, photos – La Vuelta 2017". Vuelta a España. Unipublic. Retrieved 5 July 2017. ^ "UCI Cycling Regulations: Part 2: Road Races page 29 article 2.15.128" (PDF). Union Cycliste Internationale. Archived (PDF) from the original on 29 July 2017. Retrieved 5 July 2017. ^ Wynn, Nigel (27 March 2017). "Wildcard teams revealed for 2017 Vuelta a España". Cycling Weekly. Time Inc. UK. Retrieved 29 August 2017. ^ "2017 Vuelta a Espana launched across Nimes' Roman landmarks - Gallery". Cyclingnews.com. Immediate Media Company. 19 August 2017. Retrieved 29 August 2017. ^ a b "Start list – La Vuelta 2017". Vuelta a España. Unipublic. Retrieved 29 August 2017. ^ "Vuelta a España 2017 – Debutants". ProCyclingStats. Archived from the original on 30 August 2017. Retrieved 30 August 2017. ^ a b c d e f g "Classifications stage 21 – Arroyomolinos > Madrid – La Vuelta 2017". Vuelta a España. Unipublic. Retrieved 21 October 2017. ^ "Vuelta a España 2017 – Peloton averages". ProCyclingStats. Archived from the original on 30 August 2017. Retrieved 30 August 2017. ^ "Vuelta a España 2017 – Youngest competitors". ProCyclingStats. Archived from the original on 30 August 2017. Retrieved 30 August 2017. ^ "Vuelta a España 2017 – Oldest competitors". ProCyclingStats. Archived from the original on 30 August 2017. Retrieved 30 August 2017. ^ "Vuelta a España 2017 – Average team age". ProCyclingStats. Archived from the original on 30 August 2017. Retrieved 30 August 2017. ^ "Quintana confirms he will stay at Movistar and target 2018 Tour de France". Cyclingnews.com. Immediate Media Company. 17 August 2017. Archived from the original on 18 August 2017. Retrieved 18 August 2017. ^ a b Henrys, Colin (28 July 2017). "Chris Froome the bookies' favourite as he targets historic Vuelta a Espana 2017 win". Road Cycling UK. Mpora. Archived from the original on 18 August 2017. Retrieved 18 August 2017. ^ a b c Cunningham, Craig (18 August 2017). "Vuelta a España 2017: Who are the bookmakers backing for victory?". Cycling Weekly. Time Inc. UK. Archived from the original on 18 August 2017. Retrieved 18 August 2017. ^ "Chris Froome – Vuelta a Espana 2017: Climbers, debutants and a retiring champion – who to watch in year's final grand tour". The Daily Telegraph. Telegraph Media Group. 15 August 2017. Retrieved 8 September 2017. ^ Scrivener, Peter (19 August 2017). "Vuelta a Espana 2017: Why Chris Froome starts the race as favourite". BBC Sport. BBC. Retrieved 8 September 2017. ^ Robinson, Joe (17 August 2017). "Who will win the 2017 Vuelta a Espana? We look at the favourites". Cyclist. Dennis Publishing. Retrieved 8 September 2017. ^ "Contador to wear number 1 at final Vuelta a Espana". Cyclingnews.com. Immediate Media Company. 8 August 2017. Archived from the original on 18 August 2017. Retrieved 18 August 2017. ^ a b Fotheringham, Alasdair (15 August 2017). "Vuelta a Espana Preview: Chris Froome and unfinished business". Cyclingnews.com. Immediate Media Company. Archived from the original on 18 August 2017. Retrieved 18 August 2017. ^ "Vuelta a España announces 2017 route". VeloNews. Competitor Group, Inc. 12 January 2017. Retrieved 8 September 2017. ^ "2017 Route – La Vuelta 2017". Vuelta a España. Unipublic. Retrieved 30 January 2017. ^ a b c d e f Race regulations 2017, p. 49. ^ Race regulations 2017, p. 47. ^ a b c d e f g h i j k l Race regulations 2017, p. 50. ^ Race regulations 2017, p. 49–50. ^ a b Race regulations 2017, p. 51. ^ Westemeyer, Susan (3 September 2017). "Vuelta a Espana: Lopez climbs to victory on stage 15". Cyclingnews.com. Immediate Media Company. Retrieved 8 September 2017. ^ "2017 UCI WorldTour". Union Cycliste Internationale. Retrieved 17 October 2017. ^ Wynn, Nigel (22 December 2016). "UCI announces complete overhaul of WorldTour points system". Cycling Weekly. Time Inc. UK. Retrieved 17 October 2017. ^ a b "UCI WorldTour Individual Ranking". Union Cycliste Internationale. Retrieved 17 October 2017. ^ a b "UCI World Individual Ranking". Union Cycliste Internationale. Archived from the original on 30 July 2017. Retrieved 17 October 2017. ^ "Timeline of Chris Froome's adverse analytical finding for salbutamol | Cyclingnews.com". Cyclingnews.com. Retrieved 23 January 2018. ^ "UCI statement on anti-doping proceedings involving Mr Christopher Froome". www.uci.org. Retrieved 5 July 2018. Race regulations (PDF). Vuelta a España. Madrid: Unipublic. 2017. Archived (PDF) from the original on 29 August 2017. Retrieved 29 August 2017. Wikimedia Commons has media related to 2017 Vuelta a España.